The Spirit Lake Fire Department works proactively with residents, schools and businesses to promote fire safety awareness. Providing big city services on a small-town budget, the Spirit Lake Fire Department is known for its quick and caring response to every call. The Spirit Lake Fire Department is a separate entity from City Government. 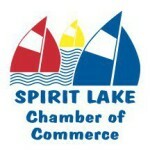 The City of Spirit Lake provides funding to the department along with funds from the City of Orleans and several townships within Dickinson County. The Department is governed by a Board appointed by member cities and townships. The Spirit Lake Fire Department provides a highly trained and well-equipped team of firefighters earning its reputation for excellent customer service by a long tradition of professionalism and caring. This page pays tribute to the many selfless men and women who perform tasks of incredible complexity, handling crises, following through tedious, painstaking work, with persistence and excellence. Through aggressive delivery of safety education, fire prevention, and disaster management, the Spirit Lake Fire Department combats a potential killer that lurks in every neighborhood. In a growing city like Spirit Lake, we are always on the lookout for firefighters to join our ranks. Certifications or qualifications are welcome immediately. The Spirit Lake Fire Department is a volunteer organization.